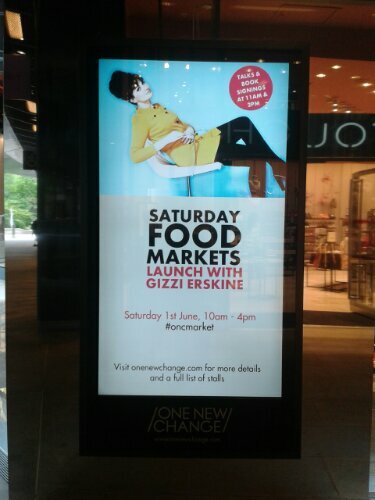 Gizzi Erskine is one of the most exciting cooks and food writers of our time. Combining an infectious passion for food with a signature vintage style, Gizzi isn’t afraid to break from the crowd and tell it like is whenever it comes to anything edible. Thus, when I heard she’d be in the City of London to give a talk at the launch of a new weekly food market at One New Change (adjacent to historic landmark St. Paul’s Cathedral), I threw on the first thing I could find in my cupboard and hot-footed it down to the location. Once there, I found an array of artisan food producers, selling the most aromatic and melt-in-the-mouth delights. My eyes feasted on handmade doughnuts by Cakehole, spicy Japanese-seasoned nuts from Kinomi, Indian spiced biscuits by Pistashio Rose, gooey chocolate brownies and tarts by Galeta, beautiful Mexican cheeses from Gringa Dairy, moreish Macarons by Cutter & Squidge, mouthwatering bresaola and Hungarian spiced salumi from Picco, arrays of honey from Londoner Curtis, a.k.a the charming Local Honey Man, oils from Morocco courtesy of Arganic and so much more! My stomach rumbled appreciatively for the entire afternoon! I stumbled upon so many delectable goodies, I actually need to list my favourites in a separate blog so that this post doesn’t turn into a dissertation!